WORKING on a little restoration project and thought you might enjoy following along. This is still a work in progress and I will add more as I continue the restoration. Click on the little pictures to pop up bigger images!! 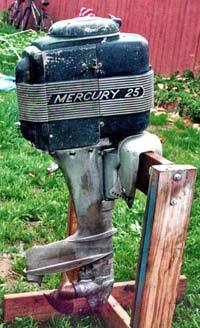 With the success of the 10HP Lightning KE-7, Mercury engineers set upon a project to create a new motor to revolutionize big outboards. This market was still dominated by the leftover WW II OMC quads and opposed twins, designed in the late 20's and early 30's. 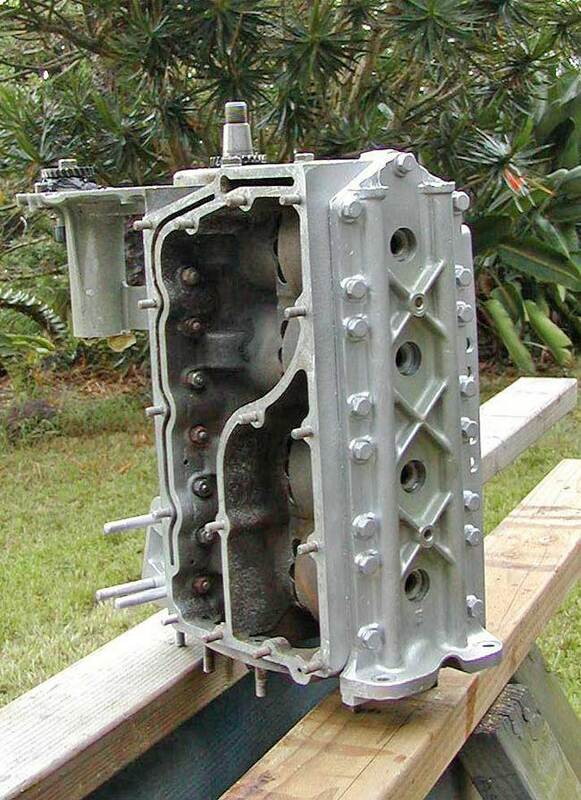 A number of designs were tried, opposed 4's, V-4's, square fours, and big twins, but the final design settled on was the alternate firing inline 4. 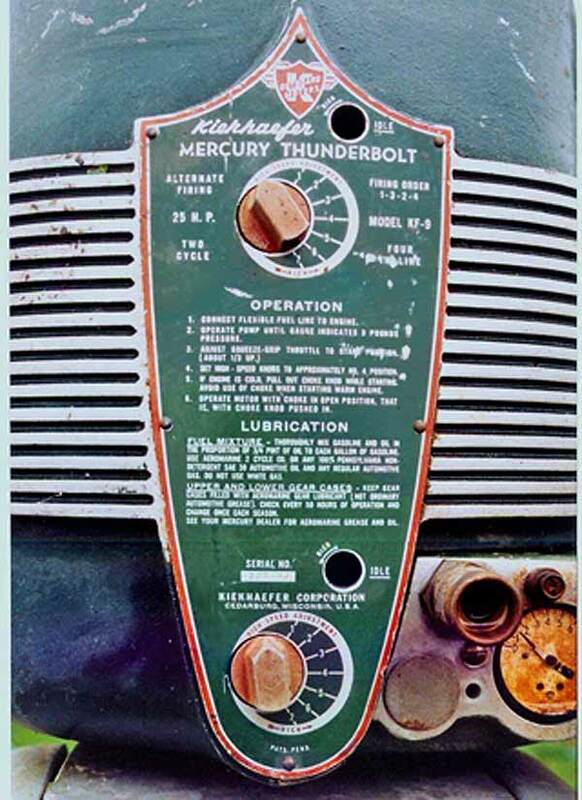 This engine was introduced in 1949 as the model KF-9 THUNDERBOLT. Early models (of which this is one) had problems with connecting rod failures and weak ignition coils. 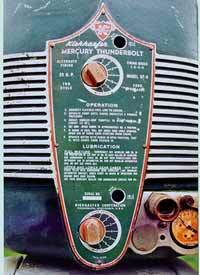 With no rewind starter capable of cranking this beast it was originally introduced with a chrome flywheel that required rope starting. This engine has a rewind kit installed. 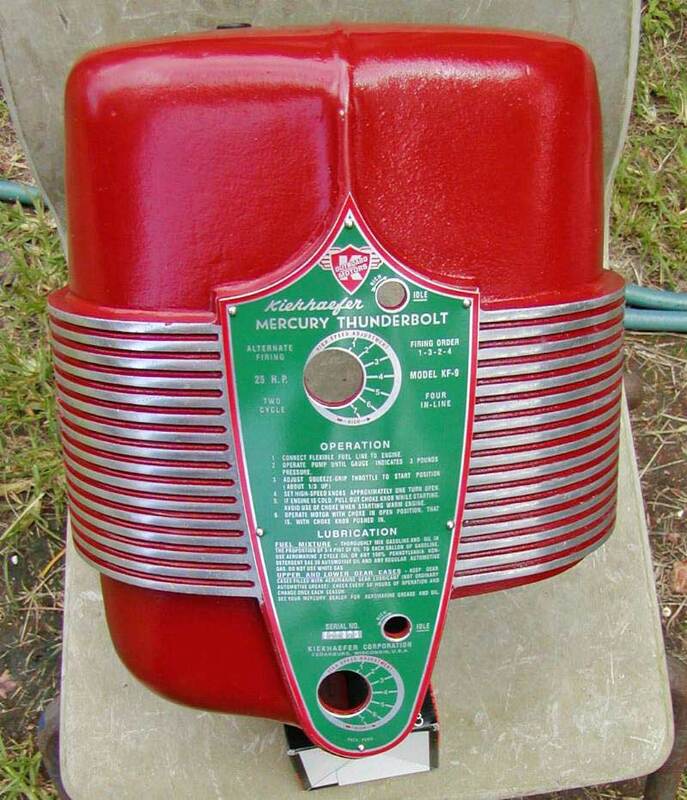 Still had the original tape wrapped Fairbanks magneto coil, so not run much as a result. These motors were not real popular in the first few production years as they were expensive and had no rewind or gearshift, these big "25" HP motors are scarce to rare and are very popular with collectors. I was contacted thru my website by a gentleman in San Diego and was offered this motor as you see it here. Negotiations resulted in my purchase and the motor was shipped with the powerhead in one box, the rest in another. Unfortunately, the seller had cleaned the motor with a pressure washer. The exhaust cover was loose; someone had removed the funny nuts that hold it on, and as a result the powerhead got water in it. On the 5 week trip to Hawaii this was not a good thing! Disassembly of the motor revealed water damage to 3 out of 4 wrist pins and rods. The original weak bottom guided rods were replaced with later model 600-4 top guided rods as were the wrist pins, washers and bearings. New rings were fitted, all bearings were replaced. Fortunately the top and lower mains were undamaged by the water. 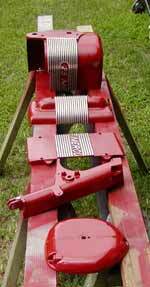 These engines have 2 ball bearings on each end of the crankshaft and a solid steel centermain. 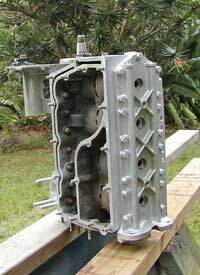 Later model 4 cylinder Mercs have one larger bearing and a split race centermain with an aluminum spacer block. 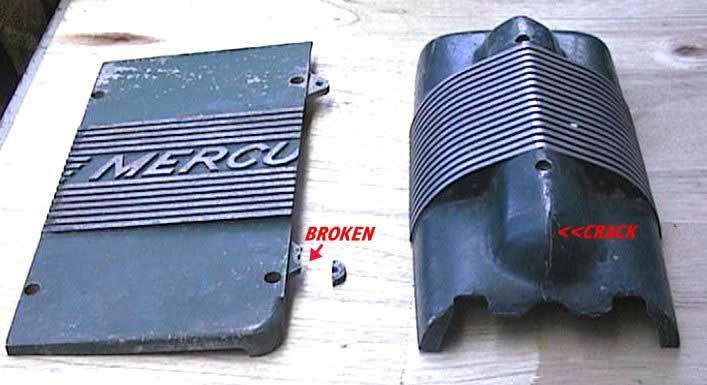 Additionally, the motor was mishandled by the USPS and the damage seen here resulted along with bent and broken carburetor needle valves. 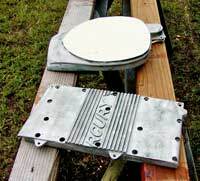 I sent the broken covers out to my friends at Phils' Performax Marine and Phil expertly repaired the breaks. I got some freight damage insurance bucks out of the post office so that helped some with the expenses! 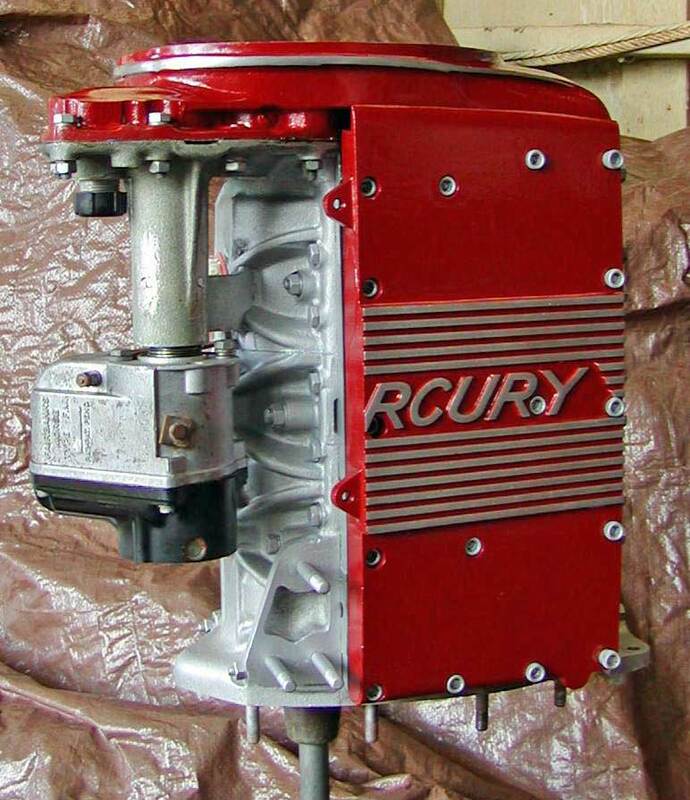 The decision was made to paint this one RED as it is the belief that if you wanted a red motor, and were willing to pay a little extra for it, the factory could be convinced to build you one. I also remember seeing some in this color 40 plus years ago in Indiana. All the covers were sandblasted clean before painting. 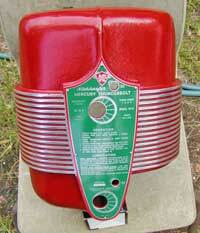 This is a picture of the front cowling all done with a new reproduction faceplate made by Tom Moulder. He does a great job on these, if you are restoring an old Merc, this is the finishing touch! 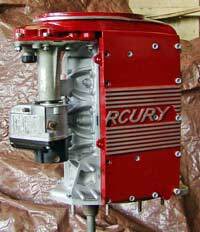 I picked a more subdued red color for the motor as in 1949 the selection of bright colors was pretty limited. Doesn't this thing look COOL in red?!! You just GOTTA love it! BE sure to remove the back cover if you rework one of these motors. Replace the 4"O" rings used to seal the area around the spark plugs. I got some at ACE hardware. There are small passageways and holes that easily clog on these blocks, this one was pretty badly restricted. Reassembling the basic powerhead was pretty straightforward, there was some tricky work on the reed cages and the centermain as the alignment pins used on this motor are very small and require a lot of diddling to get them to fit into the mating holes. I was interested to see the KF-9 uses the same 8 reed block as the KG-9 thru MK55, but the reed stops are beveled on the top to clear the crankshaft counterweights. Other than this, the aforementioned rods and port size and timing, it appears internally identical to the KG-9 model. Since this is to be a running restoration, I decided upon the later Tillotson 15/16ths venturi AJ50A carburetors with the filters built into the float covers and replumbed the original copper lines with flexible lines throughout the fuel system. Should add a little kick over the original 3/4 venturi AJ31A carbs too! No timing marks were provided on the gear train so I timed the magneto to the crank with a dial indicator. The service manual says not to advance KF-9 models over 210 degrees but I can see no reason not to go to the later specs with the better rods. Anyone have any experience with this?? The continuation of this project is on the next page, click on the link HERE to continue! My thanks to Charlie and Phil Williams at Performax Marine, Tom Moulder and Dave Losvar at Sea Way, and Bob Grubb at Grubbs' Marine for assistance with locating parts for this motor.